The Kyuquot Health Centre has offered more accessible services to the area’s Nuu-chah-nulth residents since opening a year ago on the Houpsitas reserve. Pictured are community health representatives Shirley Hansen (far left) and Elizabeth Jack, with NTC Non-Insured Health Benefits Program Coordinator Robert Cluett and Steinar Vage (far right), who is the Ka:'yu:'k't'h'/Che:k'tles7et'h' First Nation’s director of community services. Residents of the Ka:'yu:'k't'h'/Che:k'tles7et'h' First Nations’ reserve of Houpsitas are seeing an increased access to health care one year after the opening of a clinic in the Kyuquot community. 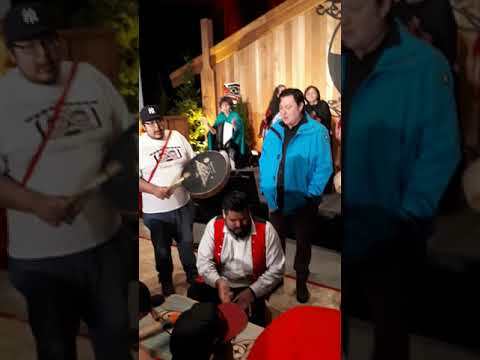 Until October 2017 those who lived in Houpsitas, which has over 160 residents according to Nuu-chah-nulth Tribal Council records, had to cross the water for medical attention at the nearby health clinic on Okime Island. This changed a year ago, when the Kyuquot Health Centre offices opened on the second floor of a new three-storey building in Houpsitas. Enid O’Hara, Island Health’s manager of rural services, said that this has benefitted most people living in Kyuquot, which is located on Vancouver Island’s northwest coast. Now a registered nurse works Monday to Thursday in the new centre, then Fridays at the old health outpost on Okime Island. The nurse resides in Okime and is on call evenings and weekends. “The services have remained the same…the availability has become easier,” he added. The new health centre offers basic medical services to treat ailments such as commons colds, minor skin wounds and urinary tract infections. Over the last year the facility has seen approximately 200 visits a month as patients appear to be seeking medical attention sooner, said O’Hara. Vage said a doctor usually flies in every other week for three hours of scheduled appointments. Bearing the familiar mark of a Red Cross station, the Okime clinic was established decades ago to serve several canneries that once operated in Kyuquot. O’Hara said the Red Cross outpost originally offered a pay-for-service model of care that possibly dated to before World War II. There’s still a considerable amount of discretion used to determine if a transfer is necessary to a hospital. Patients are usually moved for care in Port McNeill, which has the closest hospital on the other side of Vancouver Island, or to Campbell River. The Houpsitas clinic doesn’t provide x-rays, so patients who need basic imaging or hospitalization will usually be sent to Port McNeill, while those requiring a specialist are directed to Campbell River or a larger centre, said O’Hara. “If it’s a heart issue or another serious issue, they will be set up for a medical evacuation,” noted Vage. The community is also finishing the conversion of a basketball court into a new helicopter landing pad. Weather conditions have sometimes made landing a challenge in Kyuquot, which often uses the field by its school for helicopters. As is the case with other remote Nuu-chah-nulth communities, expectant mothers are usually moved from Kyuquot to larger centre with a hospital four to five weeks before the due date.